Turns out Falkirk have… And since it’s my mission to review all the Shed manufacturers in Scotland let’s see what they’ve got to offer. Yeah? We’re looking specifically at Google’s top 4 Shed Manufacturers in Falkirk and we’re using the search term; Garden Sheds Falkirk. We’re not interested in the paid ads as they’re usually just the online companies that have nothing to do with the locality to the area you’re interested in. In this case, we’re only interested in Shed Manufacturer’s operating in Falkirk. We don’t talk about ourselves! Nope – this is not a sly skanky ad for Gillies and Mackay, we are not in this review. This is purely for my research purposes and I take a clear, impartial view on all companies I review. We only talk about 8’ x 6’s in our comparisons, it makes things easier. The opinions in this blog are based on my own personal judgement and what I believe is important when it comes to the perfect Shed; Specification, Price and Service. Based in Dunmore, Falkirk – Anderson are a family run timber merchants. On first thoughts, the website is good, clean and easy to manage. This is a big deal in the Shed industry as we’re very much used to dealing with websites from the 90’s. Luckily Anderson are a bit more advanced. They also include a specification list!! Yeay. Looking specifically at their Garden Shed we have the following information to consider/compare. Which can only be a good thing right? Well… it’s not bad but it’s still not Redwood. Anderson are using Whitewood (Spruce) for all their timbers. EXTERNAL?! EXTERNAL!! How many times? No customer EVER asks “So what’s the external thickness, you know the thickness I would get if it wasn’t sawdust?”. I suspect the actual size of the cladding is 19mm? Big tick if it is. We need more 19mm in Scotland. Roofing felt is a 40kg weight (180g/m2) we like this and they torch on as standard! Anderson Timber are using 68mm x 38mm CLS framing with an option to upgrade to 95mm x 48mm. 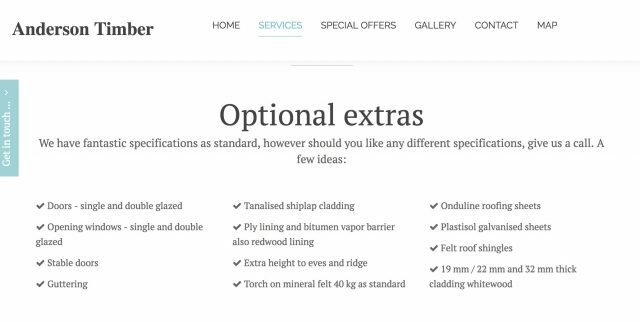 In fact Anderson Timber details all their optional extras which is quite handy if you know what their benefits are. I like this because I’m a Shed geek. But what I don’t like is the fact Anderson Timber have NO PRICES?!! And the Shed Gods wept . I’ve done my usual snooping on the old Facebook to see if anyone has asked for a price but nope. I did find reviews on Google Reviews for Anderson Timber and they’re all really nice, which is definitely a good sign. Some say, worth the money, which usually means the person has paid more than they initially expected. I’d say Anderson Timber are probably charging between £500 – £700 for an 8’ x 6’ based purely on the specification. Feel free to let us know Anderson Timber! 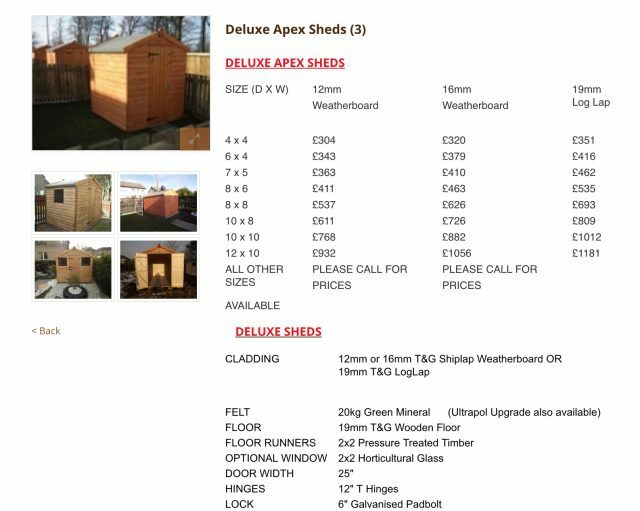 Basic level information from Apex Garden Buildings (Sheds, Falkirk) and very little on the Shed specification. We know that the buildings can either be made in 16mm or 21mm cladding but there’s nothing to tell us what that timber is or any of the other timbers in the Shed either. Looking at the prices given and the pictures available I’m pretty sure it’s Whitewood (Spruce) that is being used. Overall the Shed itself seems to be well constructed – I’m not sure if the above door strips are a constant feature but it’s good to see Apex Garden Buildings using weatherproofing techniques at least. I’m not sure about the sizing – this could well be the external size, in which case, it’s likely the real measurements are 14mm and 19mm. Looking at their reviews, it’s clear a fair few are just ‘mates’ rating but there are genuine customers too. I’d be inclined to check them out. Lots of nice things said about customer service. There are some harsh comments about workmanship and rough timbers. It’s rough because the quality of timber is cheap. Let it be known, if you plan on buying a Shed or other garden building online without actually visiting the premises to view display buildings then you better be damn sure you know what they’re made of and the expected finish. Otherwise, you’re just setting yourself up for disappointment. You can’t expect to pay half the price of a quality Garden Building and not have a difference in finish or materials. I’m sticking up for Apex here when reading through the reviews and I think they’ve done amazingly in their replies to defuse the upset by offering to remedy. AMR Sheds – I’m not going to lie, they make me want to greet. From what I can understand we have AMR Sheds, AMR Log Cabins and the previously reviewed Apex Garden Buildings all operating together? 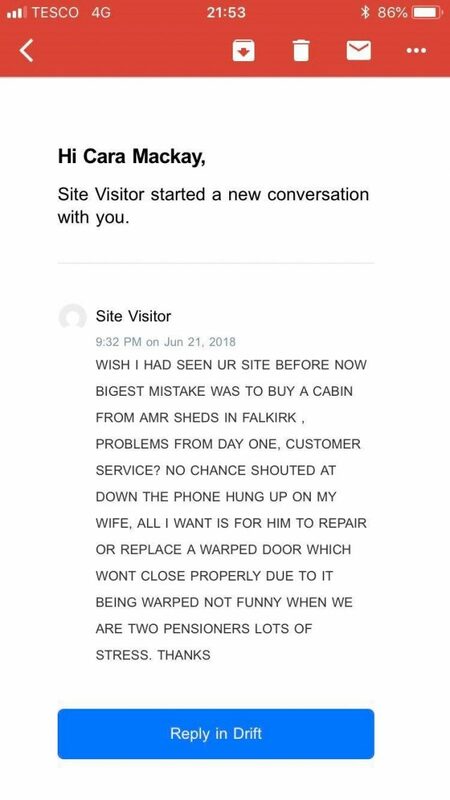 What really makes me cry about AMR Sheds is the customer service. I have come across AMR in previous research. However, in June an elderly couple approached me through our website chat to explain their complete despair. Now – I had thought about not sharing this as the circumstances were unexplained from AMR and the couple never got back in touch with me (I had offered to rectify the door for them myself). So it is probable that AMR may have fixed this. However, given the other reviews, I think it highly unlikely. But not everyone has had a bad experience with AMR – for the majority published online, it seems the sun shines out AMR’s Shed door. So let’s continue, shall we? Oh no, wait that’s right… AMR is Apex and Apex is AMR. I think? I’m confused too. The pictures, price and description for AMR and Apex are both the same. The Facebook Page for AMR has a most recent update of Apex and AMR at the same premises. What I think is happening here is AMR are dropping their Sheds for Apex and concentrating on their Log Cabin side of things. Which is probably a good thing given AMR aren’t exactly winning in the Shed customer services department. And our final review tonight is SJS Fencing – I love a fencing company that morphs into Sheds. Given SJS Fencings background it’s no surprise that they’re far more explanatory than most about their materials and it is a blessing to see/read! 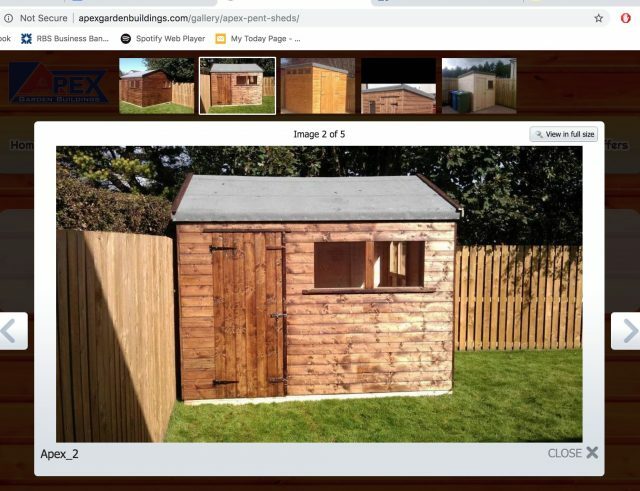 SJS Fencing also make a point on their homepage as well, that advises customers to check the finished size of timbers advertised by other Shed manufacturers. SJS acting in the customers best interest. Good lads. Beast. That’s a lot to be good at. SJS seem to be managing though, the reviews are good and with happy customers. The majority of reviews are to do with their other services though and not much on the building side. Be nice to see some more Sheds on their Facebook too. SJS Fencings prices are very similar to Apex as is the specification I would imagine. It’s good to know the flooring is actually flooring and that the timbers have been sized properly. It would be nice to know what kind of timber for sure, but I very much suspect Whitewood (Spruce) given the price. You get what you pay for. I’d love it if all Sheddies could appreciate this – especially when companies like SJS are trying to keep a Shed affordable for most and therefore the timber has to be cheaper. 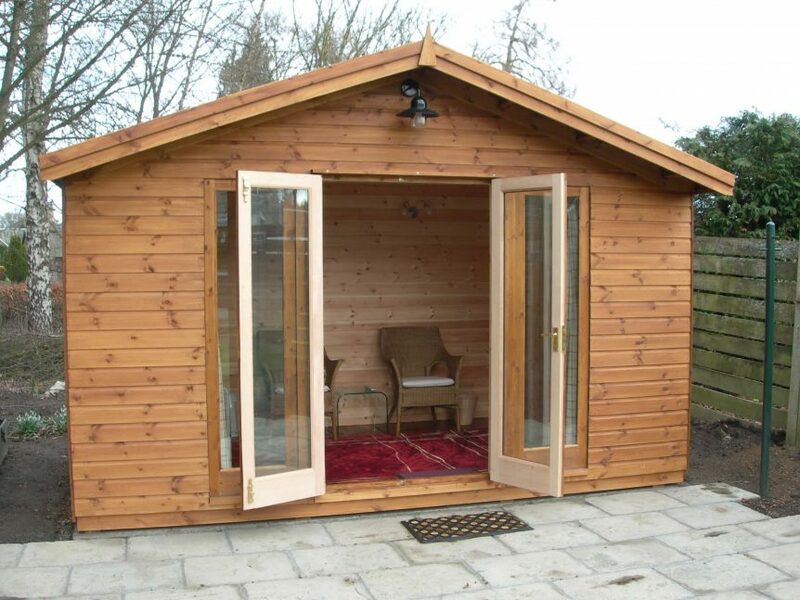 £535.00 for a 19mm 8’ x 6’ Shed is a fair price. However – remember that there is a reason Whitewood and Redwood are priced accordingly. And that is us for another week Sheddies!! It’s taken me over 3 days to actually get this written. It’s kind of like therapy for me but at the same time I just get so miffed and have to stop before I do myself a mischief. Moral of the blog is; don’t expect any more than what you can see for yourself. Always check external and finished sizes, and even when the Shed Manufacturer is a merchant, fencer and landscaper all rolled into one… they are far more likely to explain their materials than the rest. PS If there’s a particular company you’d like me to review that I haven’t already please let me know! !